Jubise Casino is no longer available . Click here for alternative casinos . A classy and thoroughly entertaining online and mobile gambling experience is what can be expected at Jubise Casino. Offering high-quality online casino games in high definition, Jubise provides its players with enjoyment, the chance to win real money rewards, and also gives them access to impressive bonuses. It’s safe, secure, and user-friendly environment lets players focus on what matters the most – having fun and winning! Jubise casino provides online casino players with the opportunity to play great games in a pleasing digital environment that is both welcoming and easy-on-the-eyes. It provides high-definition (HD) entertainment, lucrative sign-up bonuses, and even offers a mobile gaming option, giving players the chance to access all of its outstanding casino action on the go. If you’re the type of player who likes to enjoy quality casino gaming, but who doesn’t require or want a massive selection of games from which to choose, Jubise online casino is perfect for you. Unlike many other online casinos, Jubise Casino does not offer its players a broad selection of games. Instead, it has a modest portfolio of just over 30 HD games. Jubise Casino games are provided by SoftSwiss. In spite of having a relatively small portfolio of games, the casino does not lack variety. In addition to Slots, Roulette, and Video Poker, Players can enjoy card games like Blackjack, Baccarat, Double Exposure and Pontoon, as well as poker games like Casino Hold’em, Trey Poker, Caribbean Poker, and Let It Ride. Other exciting games include European, French, and America Roulette, Jacks or Better and Wild Texas Video Poker, and a large variety of slot machines. Players can spin the reels of exciting slots like Lucky Lady’s Clover, Princes Royal, Brave Viking, Cherry Fiesta, Aztech Magic and many others. In addition, Jubise provides unique casual games not typically found at other online casinos, such as Minesweeper and Horse Racing. Players can access games via Instant Play and also have the option of enjoying the Jubise mobile casino, which allows them to enjoy all of its games on its mobile-friendly HTML5 platform. Jubise Casino welcome bonuses for new players are very rewarding and highly lucrative. 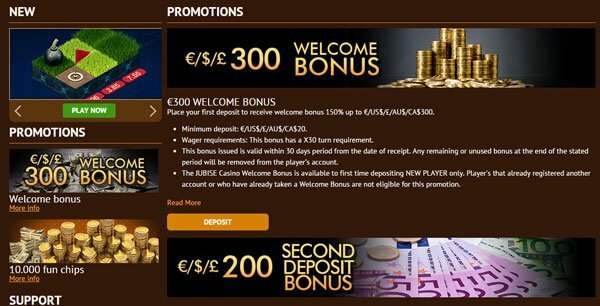 First, new players can take advantage of a 150% welcome bonus up to €/£/$300. This can be followed up with second and third deposit bonuses. There is also a Fun Chips bonus that rewards every new player with 10.000 fun chips, letting you play games without risking your own money, as no minimal deposit is required. Jubise promotions for existing players are also quite generous and include a Weekend 100% Bonus, a Mystery Monday Cash-Drop (a free bonus every Monday), and a Wednesday 50% Match Bonus. Multiple currencies are supported and deposits and withdrawals can be made at the casino using different banking methods. Accepted Jubise payment methods include credit card (Visa and MasterCard), e-wallet (Skrill and Neteller), prepaid card (Paysafecard), and pre-paid voucher (Ukash). At the time this Jubise.com review was written, the customer support that was offered was extremely limited. Players who have questions or concerns can either see if they can find the answers and assistance they seek in the FAQ section or they can fill out a contact form via email. No live chat or telephone options are available. The casino platform supports two languages: English and Russian.